Belgian investigators find evidence that man who set off bomb at a Brussels train station sympathized with ISIS. Belgian investigators on Wednesday found evidence that a suspect who set off a bomb at a Brussels train station a day earlier was a sympathizer of the Islamic State (ISIS) group, AFP reported. Police found explosive materials in a raid on the home of the suspect in Molenbeek, a Brussels district which has been linked to recent deadly terror plots in France and Belgium, prosecutors said. 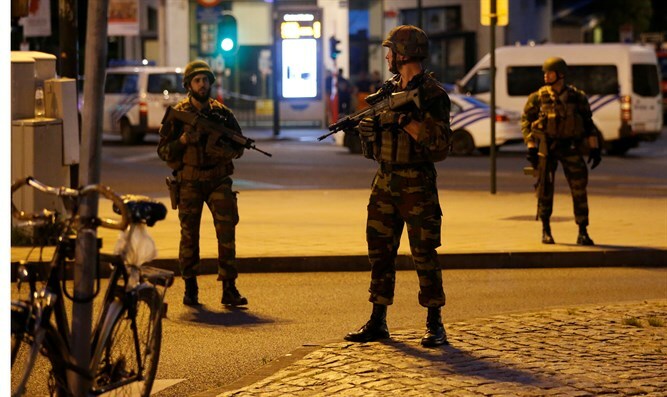 Belgian authorities identified the man, who was shot dead by a soldier, as a 36-year-old Moroccan national with the initials O.Z., while local media named him as Oussama Zariouh. No one was injured in Tuesday's foiled attack at Brussels Central station, but officials said the consequences could have been severe had the bomb full of nails and gas canisters detonated properly. "It could have been much worse," Belgian federal prosecutor's spokesman Eric Van Der Sypt was quoted by AFP as having told a news conference. "It is clear that he wanted to cause more damage than he did." The man shouted "Allahu Akbar" during the attack, he said, confirming witness reports. Van Der Sypt later said a statement that a search of the man's home "showed that he probably made the bomb there." "Both possible chemical substances and materials were found that could serve to make explosives," he said. "There are also indications that the suspect had sympathies for the terrorist organization ISIS." Belgium has been targeted by terrorists in the past. In March 2016, terrorists affiliated with the Islamic State (ISIS) carried out a coordinated attack at Brussels Airport in Zaventem and Maalbeek metro station in the city, killing 32 people. The attacks were carried out by the same Brussels-based cell behind the November 2015 suicide bombings and shootings in Paris which left 130 people dead. Soldiers have been deployed at railway stations and landmark buildings in Belgium since the Paris terror attacks, when a link to Brussels was first established.